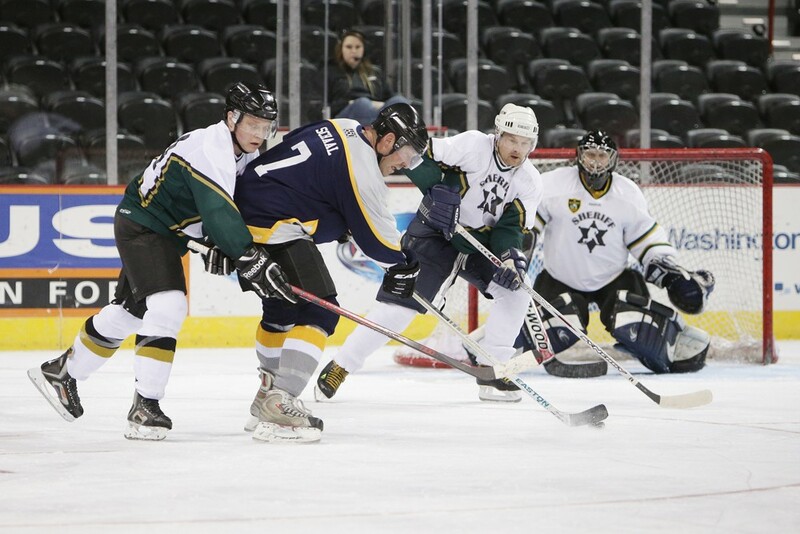 For the past five years, the Spokane Police Department has played a hockey game against the Spokane County Sheriff’s Office to raise funds for the Behind the Badge Foundation and Chiefs Care. The Behind the Badge Foundation honors and supports Washington state law enforcement personnel who have been seriously injured in the line of duty and their family members in the case of death. Chiefs Care provides continuing education for Spokane Chiefs players. The original game was played to provide support for the families of four Lakewood police officers killed in a coffee shop in 2009. 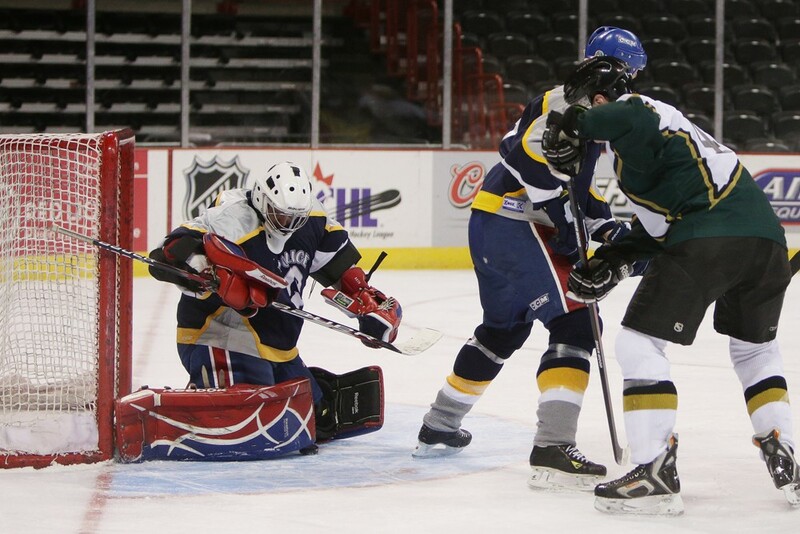 The hockey game raises an average of $3,000 through a silent auction that takes place during the game. 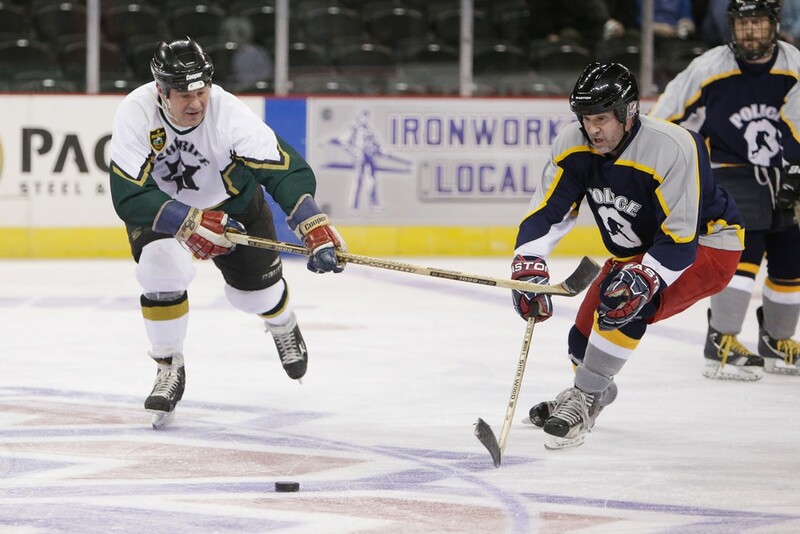 This year, the Spokane Police Department won 5-1 in front of 800 people. 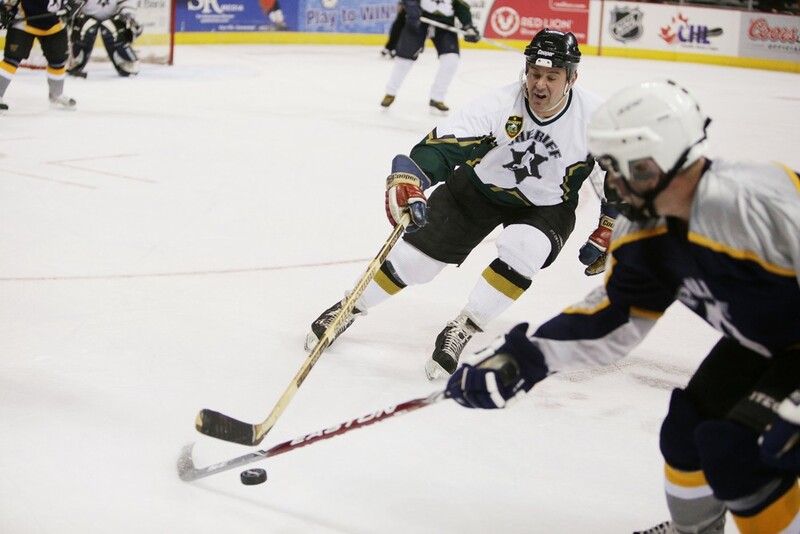 Spokane County Sheriff's Office/Spokane Valley Police Department Deputy Joe Bodma, left, and Spokane Police Department Detective Jeff Barrington chase a puck, during the first period. Spokane Police Department Corporal Jeff Schaal (7) positions himself for a shot as he is challenged by Spokane County Sheriff's Office/Spokane Valley Police Department Deputy Clay Hilton, during the first period. Spokane Police Department Officer Brad Moon, left, blocks a shot by Spokane County Sheriff's Office/Spokane Valley Police Department Deputy Clay Hilton, during the second period. Moon is the founder and organizer of the game. 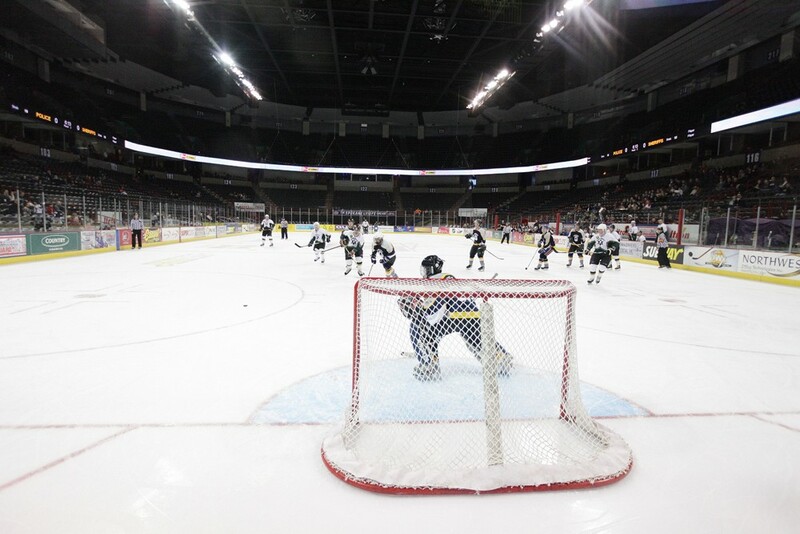 Spokane Police Department, blue jersey, and Spokane County Sheriff’s Office, white jersey, play the second period of a hockey game. Spokane Police Departments Retired Frank Scalise, left, and Spokane County Sheriff's Office/Spokane Valley Police Department Deputy James Ebel fight for a puck, during the second period. Spokane County Sheriff's Office/Spokane Valley Police Department Sergeant Khris Thompson (30) attempts to block a shot, during the second period against the Spokane Police Department. 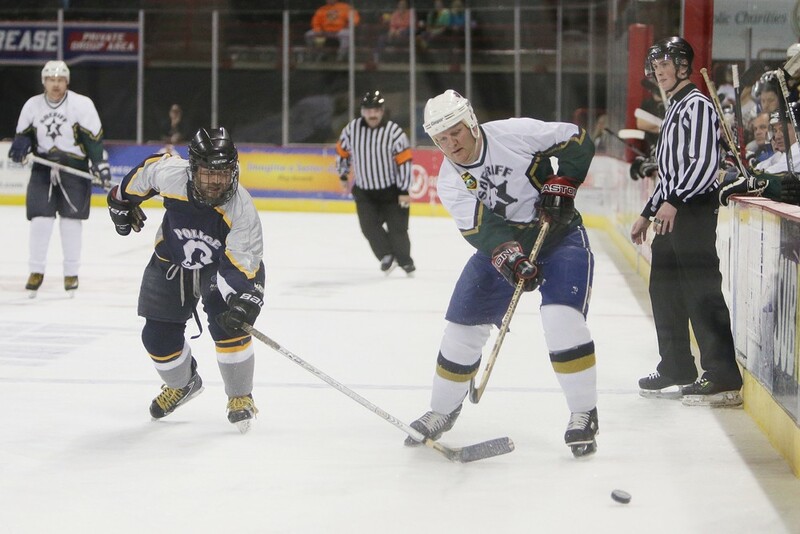 Spokane County Sheriff's Office/Spokane Valley Police Department Deputy Joe Bodma, left, and Spokane Police Department Sergeant Brad Hallock fight for puck, during the third period. 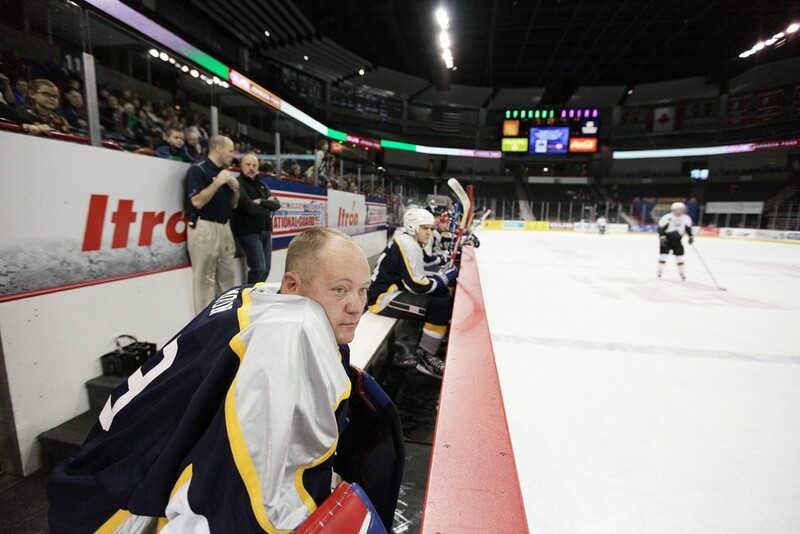 Spokane Police Department Officer Brad Moon watches the third period of a hockey game against the Spokane County Sheriff's Office. Moon is the founder and organizer of the game. 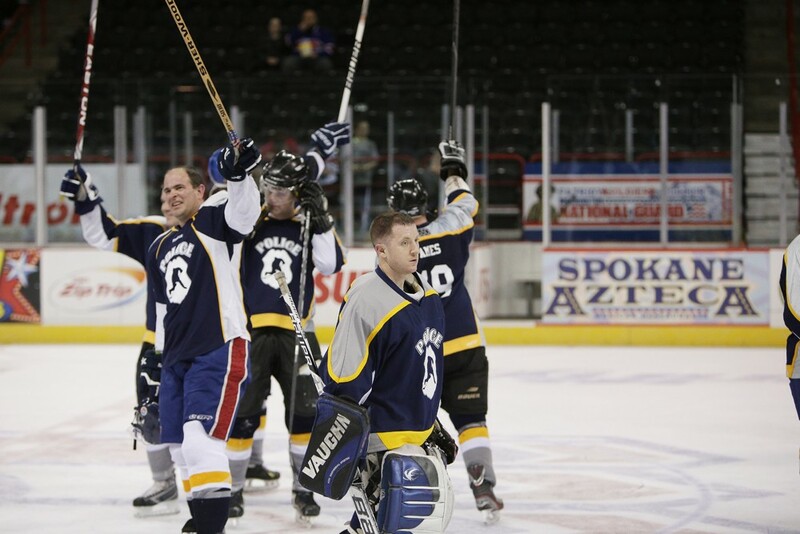 The Spokane Police Department team celebrates after winning a hockey game against the Spokane County Sheriff’s Office. 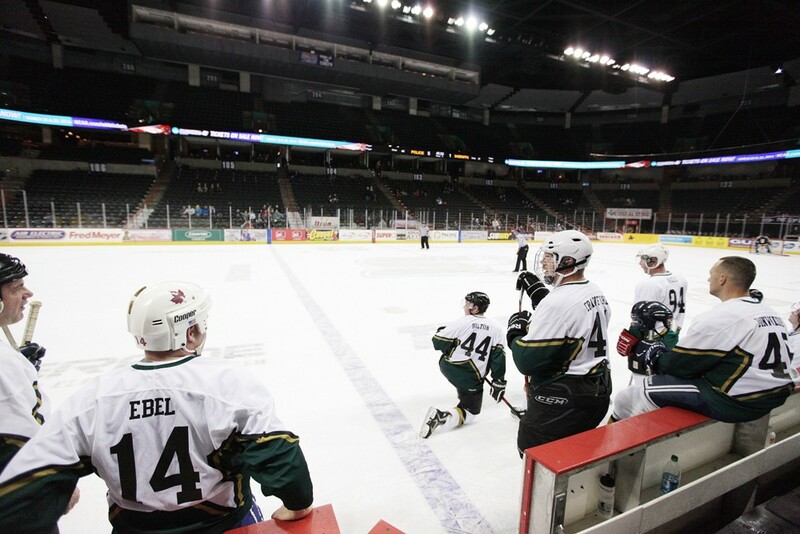 Spokane County Sheriff's Office/Spokane Valley Police Department Deputy James Ebel, bottom left, and other members of his team watch an overtime style shootout after a hockey game against Spokane Police Department. 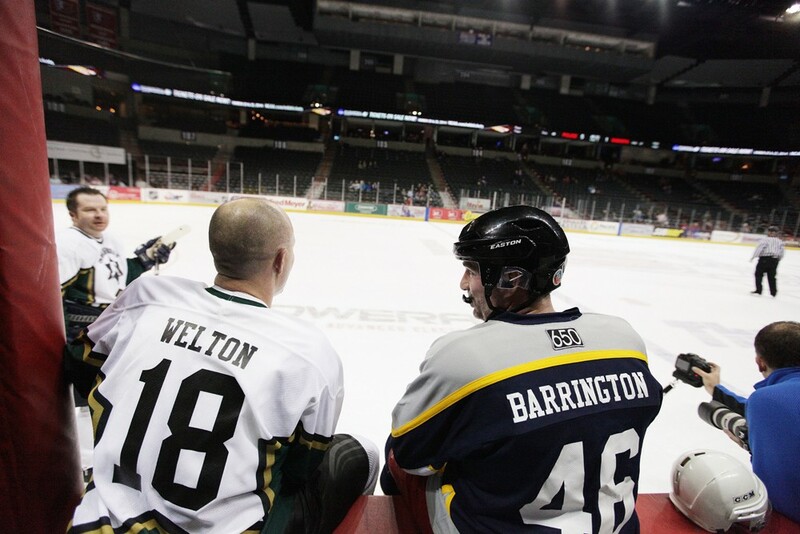 Spokane County Sheriff's Office/Spokane Valley Police Department Detective Jeff Welton (18) and Spokane Police Department Detective Jeff Barrington (46) speak during an overtime style shootout after a hockey game. 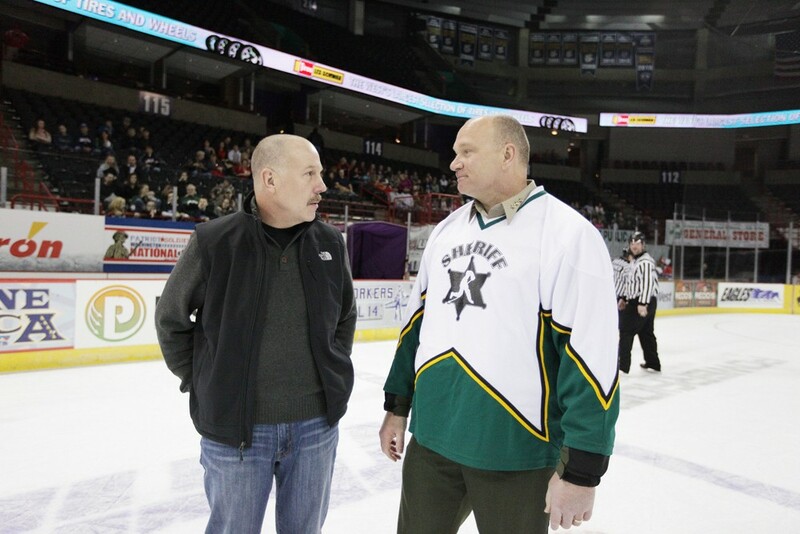 Spokane Police Department Chief Frank Straub, left, and Spokane County Sheriff Ozzie Knezovich speak after a hockey game. 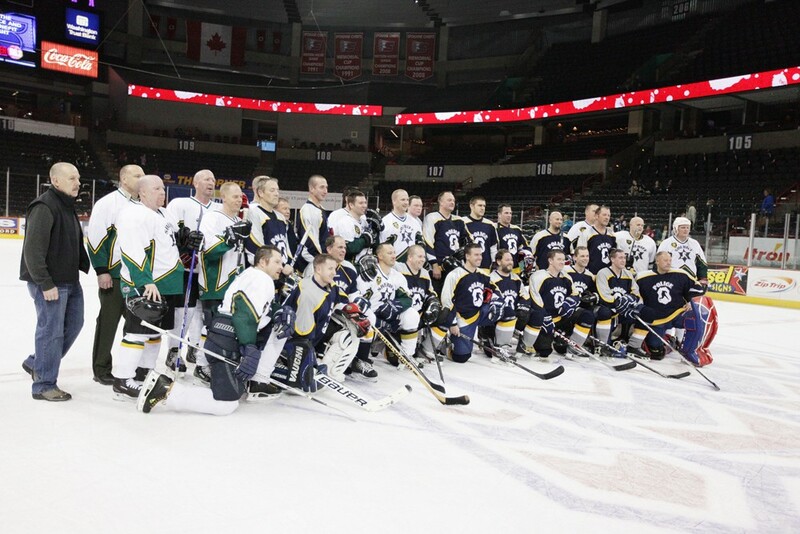 The Spokane Police Department and the Spokane County Sheriff’s Office teams pose for a photograph after a hockey game. 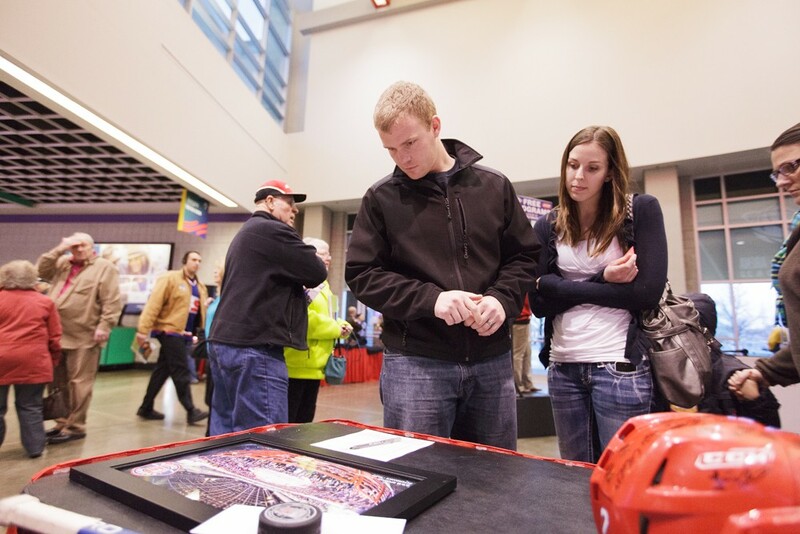 Justin, left, and Heather Arts look at silent auction items after a Spokane Police Department and Spokane County Sheriff’s Office hockey game. 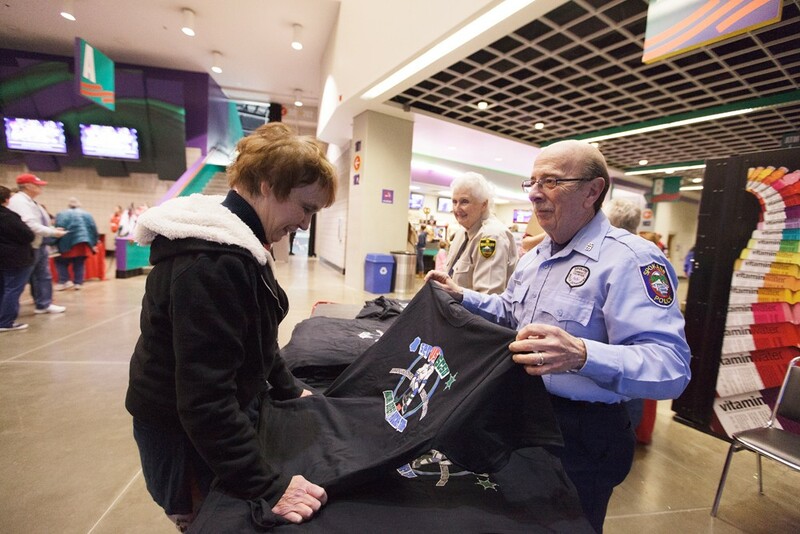 Spokane Police Department Community Volunteer John Silano, right, shows Mary Freeman a T-shirt after a Spokane Police Department and Spokane County Sheriff’s Office hockey game.